Frank the pug, making pugs famous since 1997. | Separated by a common language. « Yeah. I still ate it. Frank the pug, making pugs famous since 1997. I forgot how buggy-eyed Frank was! Yeowsa! Actually, that’s the only other movie I know that has a pug in it! I’d choose Frank over Otis though. Sorry Otis, but Frank just looks too sharp in a suit and tie combo. Yeah, I like Frank more, too. I have Milo & Otis for the kids, and it’s good, but Otis is kind of a goodie-goodie. He’s all serious-Milo was definitely the cooler one 😉 Of course, that would only happen in a movie, there’s no way a cat could be cooler than a pug! and here’s a link to more spot spottings in movies! 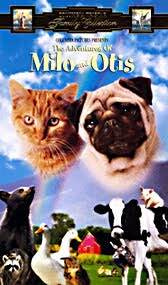 I own that Milo & Otis movie (But I don’t know where I put it! ), and I think Mom and Dad own MIB II. Yeah, I can’t really think of any other movie with pugs in it. Cats and Dogs must have one or two as extra’s, surely. Very helpful info specially the final section 🙂 I deal with such info much.